TBHC Delivers brings you the number one c-store pizza brand in the country. 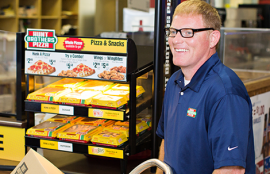 Resources, marketing materials, equipment and more — we’ll support your c-store Pizza Shoppe with everything you need. Resources and articles for c-store owners. With 29 percent of consumers saying they will drive more in June as compared to the previous month (2017 NACS Consumer Fuels), and U.S. gas prices at the lowest level for the summertime since 2005, convenience stores are ready to welcome a wave of consumers traveling near and far. In support of the summer season, Tyson Convenience today released results from a national consumer survey conducted with 1,000 U.S. adults aged 18+ to help retailers understand which prepared foods customers prefer for making their trip more enjoyable, regardless of the distance. Location is key when it comes to succeeding at convenience retailing, but so is having products in-stock for customers to buy once they get to the store. Four out of 10 shoppers are not finding what they want. Pizza has gained a solid foothold in convenience stores, and continues to rise. The segment has matured in the convenience channel from 10 years ago when fully topped pizza was the only option. Now that customer expectations for quality have risen, so too has the quality of the convenience store pizza. C-stores with growing food programs need to guard against foodborne illnesses. When retailers build a foodservice program, they are most likely to focus on the quality of menu items. However, the issue of food safety is also incredibly important, and food poisoning is a much bigger deal than people realize. Earlier this year Hunt Brothers Pizza invited stores to take part in a "25 for 25 video contest." As a way of celebrating the company's 25th anniversary, the contest would provide custom pizza-shop upgrades, ranging from new equipment to complete pizza-shop makeovers. Among the stores that submitted video entries was The Fillin' Station and on Thursday, March 23, the store will celebrate its makeover. For food retailers, the health inspector’s semiannual visits were once a mere annoyance. But new rules under the Food Safety Modernization Act shift regulators’ food-safety focus from reactive to proactive, creating the need for a more transparent and collaborative relationship between inspector and operator. In a recent survey conducted by CSP sister brand Technomic, we gauged hot-food purchase behaviors of c-store foodservice consumers. The big takeaway: According to your customers, they’re buying hot foods just as much as cold ones. The third-annual Convenience Store News Retailer Forecast Study finds that 88.6 percent of c-store retailers expect their average sales per store to increase in 2017 vs. 2016. 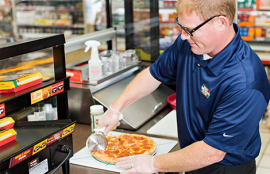 Within the overall classification of food safety "best practices," hand washing, hand care and glove usage are perhaps the three most critical routines for convenience store operators to keep top-of-mind. Sixty-two percent of consumers say they want retailers to offer more hand-held foods that are ready to eat and kept warm on display, according to new Technomic research. Foodservice will take center stage for convenience stores in 2017, predicts King-Casey, a retail consulting and design firm for the c-store industry. Hunt Brothers Pizza announced the winners of its “25 for 25 Video Contest,” in which it received video submissions from its retail partners detailing the importance of the pizza program to their businesses, families and communities. With its easy-to-eat format and versatility that enables it to showcase both tried-and-true and trending ingredients and flavor profiles, pizza remains a top pick for consumers seeking a satisfying snack or full meal. Food. It's essential to existence — not just in the broader sense as humans, but also in regards to the convenience store industry. That was the message Jack Kofdarali, chairman of NACS, the Association for Convenience & Fuel Retailing, relayed at the 2016 NACS Show. A few core statistics are crucial to understanding the size, scope and opportunity of c-store foodservice—and how your company fits into its growth. Use the following eight crucial c-store foodservice statistics to help benchmark your own business. The secret to meeting the needs of these generations is to create opportunities for customization within your fresh-prepared foodservice program and use equipment that can keep up with generations who demand instant gratification. According to the Centers for Disease Control and Prevention there are more than 250 different types of foodborne illnesses. While that number is staggering, it also means that foodborne-illness outbreaks are more common than you likely think. Convenience stores are simultaneously working to combat some lingering negative perceptions about c-store food, while trying to successfully capitalize on the strengthening trend toward retail foodservice. Brands looking to get in the foodservice game—as well as existing players hunting for a stronger point of differentiation—need to consider the fundamentals, while keeping outside-the-box creativity top of mind. With so many moveable parts, proper management of the financial sub-structure of your foodservice operation - including food costs, shrinkage, spoilage and, of course, labor - can mean the difference between profit and loss; success and failure. TBHC Delivers, the country’s largest single distributor of Hunt Brothers® Pizza, has launched its new Rolling Warehouse Guarantee, which ensures its convenience store customers are constantly stocked with all the necessary products and items they need to sell hot, made-to-order pizza, wings, WingBites® and cheese bread.